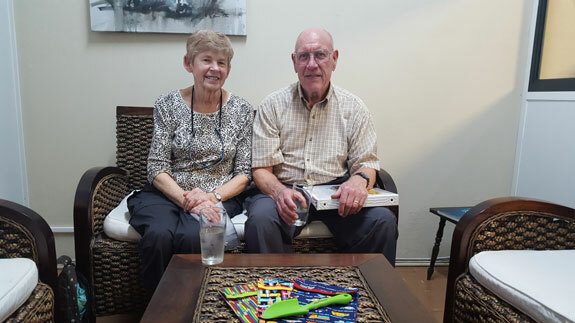 Retired Diana and Cliff Cunningham are visiting South Africa as part of their bucket list. After 9 months of planning, we were surprised when they contacted us to tell us they handmade 155 pencil cases for the Dingani Primary students in Zimbabwe. As part of our responsible tourism initiative Grow Africa, all our guests can participate in Pack For A Purpose. It allows guests to bring along much-needed items in their luggage for the projects we partner with – instead of just giving a monetary donation. While this is the Canadian couple’s 46th country over 7 continents, this is only the second country they are visiting in Africa after Egypt. Diana started making the pencil cases after Christmas last year, and the response she got from the community was great. The inside of the cases are lined with rip stop nylon, which she got donated from the sailboat community; the fabric shop and local hardware shop (they bought plastic shovels for the school garden) both gave them discounts. While they are retired – it appears they are not slowing down. They lead fulfilled lives: Diana volunteers at the Victoria International Airport Vancouver Island while Cliff volunteers at the local aquarium. They are also building floats for the Canada Part parade and are on the Board of Directors; and they inspire other seniors to travel by giving talks at Elder College. Part of their inspiration is to encourage other seniors to travel as much as they do! “It is possible but it just requires more preparation,” says Diana. Diana and Cliff are dream clients. They want to meet the locals, they care about the communities they visit and they have a heart for Africa and its people. Both have read books on Africa such as the “Elephant Whisperer” and Alexander McCall Smith’s series “The No. 1 Ladies’ Detective Agency.” We wish them a wonderful trip on the Botswana Wildlife Breakaway tour.